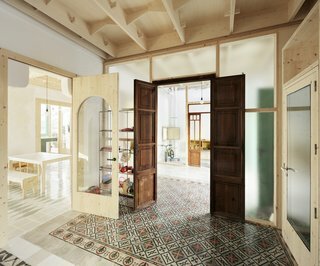 City House by SMS Arquitectos features a second-floor townhouse extension that explores new possibilities with plywood. 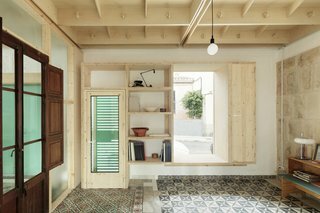 In order not to overload its original stone walls, this townhouse in a peaceful neighborhood in the Spanish city of Palma de Mallorca gets a second-floor extension of lightweight plywood, bringing its usable floor area up to 2,000 square feet. 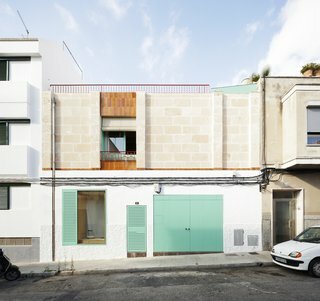 A street view of City House reveals its cheerful, teal accents. A terrace and pool at the back of the house allow the homeowners to enjoy the clement weather. 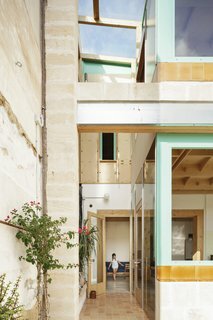 The home—owned by architects Alberto Sanchez and Aina Salva of Spanish studio SMS Aquitectos, who also designed the extension—explores the local manufacturing of plywood elements with a CNC router, and taps into the the carpentry heritage of the island of Mallorca to create the floor and framework for the extension. 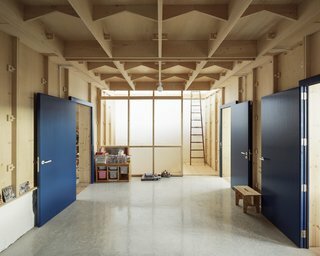 A stable and sturdy plywood system was used as the foundation for the new second-floor extension. We get a view of the factory processing of the plywood. 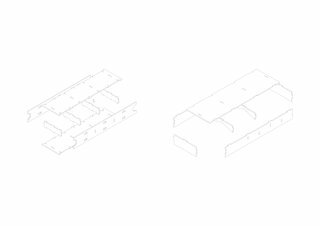 "We start from an autonomous and de-contextualized structure base or pre-existence, for which we manufactured an off-site, prefabricated plywood system," explains Sanchez. 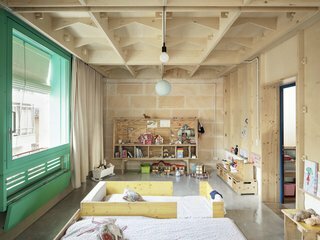 The ornate structure of the plywood ceilings recall arabesque ornamentations. 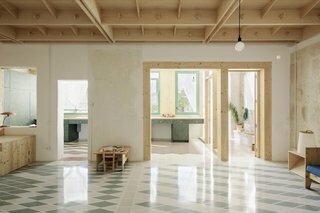 Working with 96" x 48" poplar plywood boards, the architects created a framework that gave them the chance to investigate and test out a structural system that integrates local materials and craft techniques with factory processes. 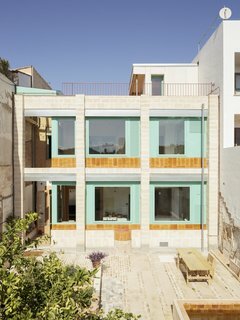 Special terra cotta tiles from Miquel Soler, a traditional tile company from the small town of Felanitx in the southeast corner of Mallorca, were used for sections of the facade and pool. 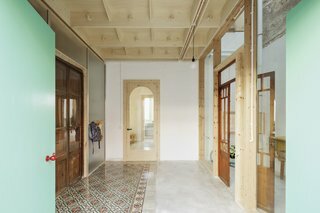 Vibrant tiles from Mallorca concrete tile brand Huguet were used for sections of the floor. 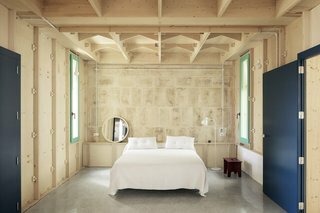 The architects’ experiments with the optimization of CNC routing resulted in a structure with a variegated geometry, and a decorative surface that marries tradition with modernity. 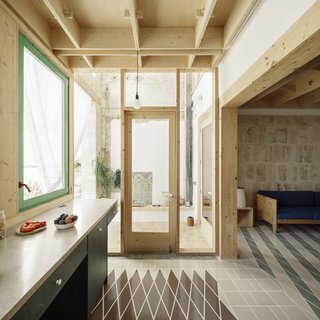 The living room flows into the kitchen. 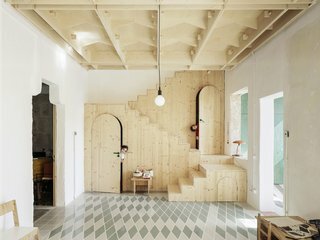 This plywood structure creates ornate patterns on both the ground-floor and second-floor ceilings, so both the old lower level and new upper level are linked through a geometric rhythm that resembles the arabesque ornamentations in the old town of Palma. The outdoor terrace and pool are accessible through a door near the kitchen. 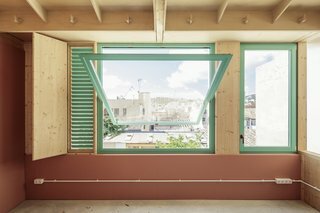 A window on the new upper floor looks out to the city. Within, the house has various atmospheric pockets. Light from outdoors streams into one of the atmospheric interior spaces. 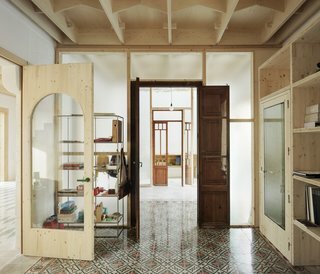 Raw wood, stone, and terra cotta complement the unvarnished plywood. The northeast- and southwest-facing rooms have a romantic ambience thanks to the soft quality of the morning sunlight that make these spaces glow. The children's bedroom and play area. There are rooms that look into an interior patio, and also rooms that enjoy the best of the afternoon sunshine, along with views of a castle nearby. 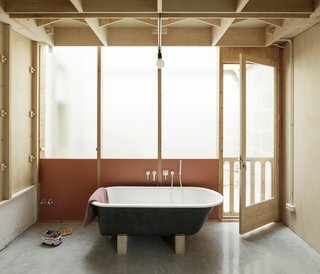 A bathroom draws sunlight in through a translucent, glazed wall. Some parts of the house have more thermal mass, and stay cooler in summer, while others with less thermal mass require heating in winter. 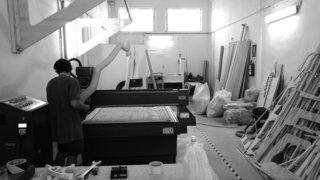 "By combining the elements of this system, defined by the capabilities of the CNC cut, the system serves as a starting point and can be reproduced in other types of buildings," says Salva. 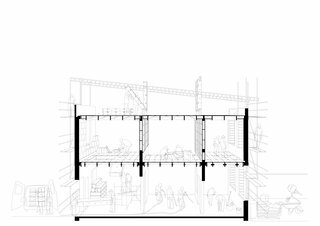 Drawing of the plywood system. 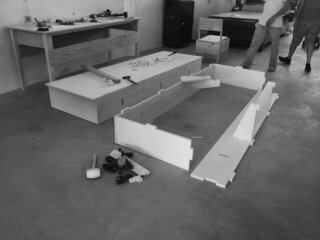 Cross sectional drawing of the installing of the plywood structure.